Is Hyperparathyroidism Misdiagnosed as Fibromyalgia? Hyperparathyroidism is often misdiagnosed because its symptoms are vague and similar to other medical conditions. In response to a new study that shows some fibromyalgia patients may benefit from parathyroidectomy, Dr. Babak Larian of the CENTER for Advanced Parathyroid Surgery in Beverly Hills today commented on hyperparathyroidism, a commonly misunderstood and misdiagnosed disease. The study, which was reported at the American Association of Endocrine Surgeons 2014 Annual Meeting on April 29, sited that nearly all patients with hyperparathyroidism who were previously diagnosed with fibromyalgia showed signs of improvement once parathyroidectomy was performed. One in five were able to stop taking fibromyalgia medications. Many patients who think they have fibromyalgia may be spending time and money on medical treatment that isn’t going to properly address their symptoms. Before someone is prematurely diagnosed with fibromyalgia, blood tests for primary hyperparathyroidism may be a simple solution. High blood calcium and parathyroid hormone levels are indications of primary hyperparathyroidism. The root cause of the disease is typically a benign tumor in one or more of the four parathyroid glands that is called a parathyroid adenoma. 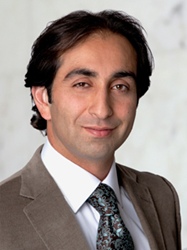 Dr. Babak Larian, the Director of the CENTER for Advanced Parathyroid Surgery in Beverly Hills, is a highly experienced and reputable board-certified head and neck surgeon. Dr. Larian is nationally renowned for his expertise in minimally invasive surgery techniques involving parathyroid disorders and is considered a pioneer in his field. Currently, Dr. Larian holds the prestigious honor of Chief of Head & Neck Surgery at Cedars-Sinai Medical Center and Assistant Clinical Professor of Surgery at UCLA. For additional information regarding Dr. Larian and the various services offered at the CENTER for Advanced Parathyroid surgery, please call 310-933-4210, or visit the expert parathyroid surgeon on the web.